There was a time, believe it or not, when video game companies lived and died by their adorable mascots. Dragon, worm, bat or bandicoot, the tubular nineties were truly a time for digital biodiversity, but by the early 2000s, the industry was beginning to trend away from the anthropomorphic hype animals of yore. And yet still along came Blinx: The Time Sweeper, a colorful platformer for the original Xbox starring a vacuum-wielding, time-manipulating feline. Naturally, the general assumption was that Microsoft seemed to be actively recruiting for a friendly, furry face to represent their newly minted Halo machine. But an assumption it remains, because in actuality, there’s a whole other side—a fourth dimension, even—to this quasi-retro story. Once the proverbial yarn ball started rolling, Pelon, as the project was codenamed during development (and also the eventual name for a female Time Sweeper), really began shaping up. “In a lot of ways, and in my mind, Blinx was the most promising game we were developing,” Ed says. “Out of that early batch of games, it was probably the best one we were working on. 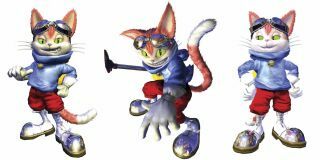 I’m a gamer, so I was excited about Blinx, about the concept, about the team working on it, and about how it felt to play. That’s more what I cared about, rather than some theory about having to have a mascot.” This is, regarding Blinx’s perceived legacy, quite the interesting point. Sadly, it was announced back in 2015 that Microsoft had abandoned the Blinx trademark, effectively rendering the series, along with any possibility of a comeback, extinct. But stubbornly, as if ticking away in mechanical testament to the series’ underdog staying power, the Blinx branded promotional clock in Ed’s office still counts the minutes and hours. So in the end, one last question obviously remains: Can it stop time? “It does when the battery runs out,” Ed laughs.